At the end of the 20th century HanesBrands began making environmental and social responsibility a priority. Hanes became one of the first companies to have a comprehensive chemical management program and was a founding member of the Sustainable Apparel Coalition’s development of chemical management guidelines. 2007 was the first full year HanesBrands tracked environmental metrics as an independent company. By 2017, HanesBrands had a 21% energy reduction; 28% fewer carbon emissions, 30% less water used, 33% renewable energy use and an 84% waste diversion rate. The goals for 2020 are impressive. Hanes is committed to reducing energy, reducing carbon-dioxide, reducing water use, secure at least 40 percent of its total energy from renewable sources and achieve zero waste by diverting company-owned supply chain waste from landfills. How does HanesBrand’s corporate social responsibility extend to the end product of Hanes apparel? Cotton is a water-intensive crop. More than 90 percent the cotton Hanes uses is grown and harvested in areas of the southeastern United States where annual rainfall generally exceeds a cotton plants’ water requirements. Hanes’ ComfortWash apparel line is made from 100% American grown cotton, further supporting local economies. With the company’s goal to be zero waste by 2020, Hanes uses sustainable materials as much as possible including recycled cotton fibers derived from cut fabric waste, post-industrial recycled cotton fibers reclaimed from the yarn-spinning process, and recycled polyester filament yarns and fibers, both from plastic bottles. Recycled yarn accounts for all of the cotton in Hanes’ black socks. Hanes has also successfully expanded the use of recycled yarn by blending it into select white socks. Additionally, cotton fabric waste that cannot be used for recycled yarn is sent to other companies that recycle/reuse the material in the production of carpeting and other commercial products. 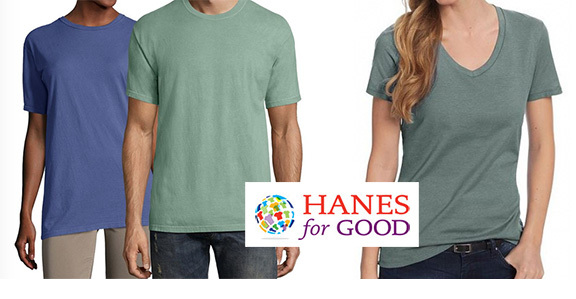 In additional to HanesBrands’ commitment to sustainability in its manufacturing of apparel, Hanes also gives back to the community through its Hanes4Education program. Each time our customers order Hanes printed apparel, $0.10 per apparel piece will be given to your K-12 school of choice. Schools can earn up to $5,000 per calendar year. Eco Promotional Products’ current Hanes offerings can be viewed here. More will be added in the coming months to fit every budget, especially for schools who might want to take advantage of the Hanes4Education cash back program.